This is a Big Headed Ant. The name "Big Headed Ant" actually applies to several types of ants. They can range in color from dark brown to red-brown to yellow. The ants with large heads are actually 1 type of worker ant. 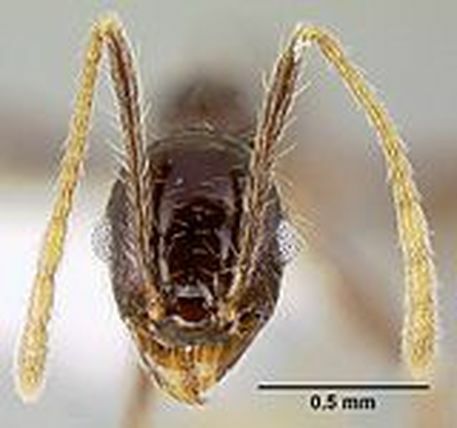 There is another type of big headed ant that has a small head, so each colony has a big headed ant and a little headed ant, but the name "big" stole the show. You can find these guys nesting in woodpiles (like a stack of firewood) or by lifting up rocks. What do Big Headed Ants eat? Big Headed Ants like protein-rich food. They will not turn down a sweet treat either. You can find them snacking on grubs and other insects, but they will eat a large variety of food from your kitchen as well. How do Big Headed Ants get into my home or business? Ants foraging will make their way into your home through the smallest crack. The good news is the nest is probably not in your home, although it may be under it. How do I get rid of Big Headed Ants? Since the nest is most likely outside of your home, you will have to find it's location and handle the ant problem there. This is the only way to get rid of the ants for good. After the ant problem is taken care of you can treat the area around your home to prevent them from coming back. It is also a good idea to seal up any cracks or small openings they can get through, and to clear back brush and trees that may be touching your house. To learn more about Carpenter Ants, click here!